Have you seen the opening ceremony outfits for the summer olympics? They were revealed on the Today Show on July 10th. There are some pretty interesting components to these outfits and some differences between the sketch and the result! First off, I want to start by saying I like these outfits. Like, not love. I really don’t like the barrets. I don’t think they work in this situation. They seem a little too over the top to me. I love the color choices. I think it was very smart to go with navy and white as the main colors (how great are the white pants and skirts?) with pops of red through the tie and scarves. I love these white skirts & want to know where I can find one! They look a little shorter in the sketch than they do on the model, I think they would be perfect hitting just above the knee so they don’t make any athletes shorter. The blazers with the double breasted buttons are immaculate. I could live without the polo logo, but I think the size is perfect for this situation; large enough to be seen but small enough that it doesn’t take over the jacket. The shoes. Can we talk about the fact that the model is wearing heels in the sketch? Heels! No athlete in their right mind would wear stilettos to walk around at the opening ceremony! That would be foot suicide! I’m glad this was fixed between sketch and execution. However, crew socks with these shoes? No thank you. I would prefer a shorter, no show sock to elongate the legs. 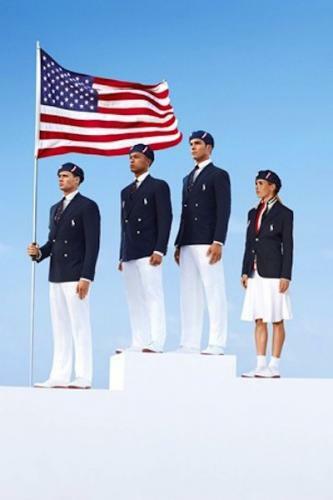 Overall, I think Ralph Lauren did a great job with our outfits for the opening ceremony. The US will certainly look very snazzy!